← Russia: Gazprom Is Huge! 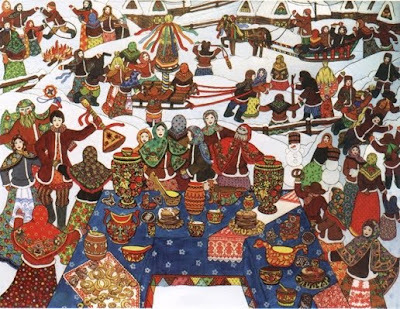 Maslenitsa 2010 will take place between February 8 and February 14. This is a pre lent festival. So as Russian traditions are observed and people eat their fill of blini (Pancakes) the festivals help to bid farewell to winter. The idea is to dispel the cold with symbols of spring other words: Pancakes with their round shape and yellowish color represents the sun and an effigy (Man of Straw) is burned to welcome warmer weather. Other activities, like group fist fights (Ouch), sledding, and troika rides, are traditional Maslenitsa activities. So look at the week of expectations!